The Queensland house or ‘Queenslander’ speaks eloquently of our distinctive lifestyle and is one of the most distinctive architectural designs in Australia. Queensland has more than one type of housing but a tradition of timber building is dominant. This distinctive tradition originated with rough timber huts of early settlement and developed into the multi-gabled bungalows of the 1930s. Buildings continued until, and were adapted after, the Second World War, leading to contemporary ‘Environmentally Sustainable Timber Houses’. a garden setting with a picket fence, palm trees and tropical fruit trees. There are many styles of the famous 'Queenslander', but share distinct construction style, internal spaces, furnishing, and gardens. 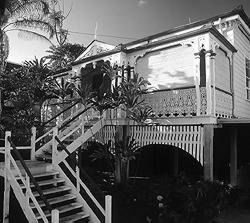 They are now valued as a key element of Queensland heritage and conservation and renovation of Queenslanders is widespread. Bell, P. (1984) Timber and Iron: Houses in North Queensland Mining Settlements, 1861-1920.University of Queensland Press: St. Lucia.